medium 3 1/2" x 2"
The plant habit is upright and dense. The bloom consists of 170 petals and 12 guard petals. The bloom has a consistent form and falls in one piece. The medium green leaves average 3" x 1 1/2". The leaves have a medium serration. The plant is suitable for landscaping and exhibition uses. 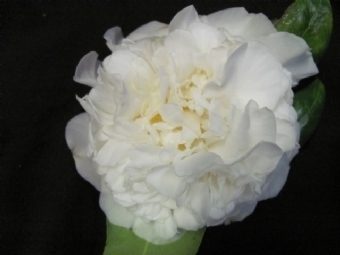 Originated by Jill Read of Lucedale, Mississippi and registered and propagated by Glenn Read Camellia Nursery of Lucedale, Mississippi.